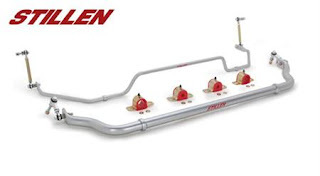 Stillen has just released new adjustable sway bars for the Nissan GT-R. The front sway bar is 3 way adjustable and the rear bar is 5 way adjustable. These adjustments will help to dial a car in to a drivers liking on the circuit. These sway bars are constructed of DOM Steel, and come complete with poly-urethane bushings, and all hardware to bolt right on. Also included with this kit is an extremely durable set of adjustable endlinks, well suited for vehicles utilizing coil overs.